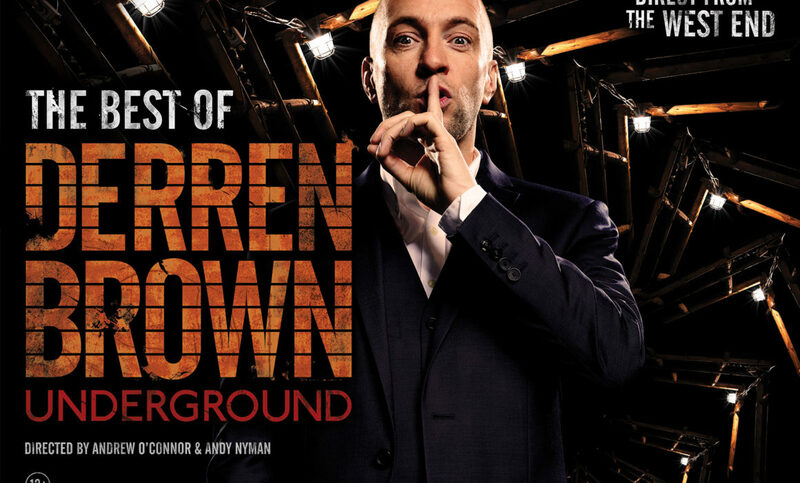 Derren Brown, the multi-award winning master of mind control and psychological illusion, is bringing his latest sensational show UNDERGROUND back to UK and Irish theatres in 2018. Derren revealed: “Underground was originally written for audiences in other countries who hadn’t seen me before. It meant finessing and re-visiting past pieces and seeing them with fresh eyes. I sat down with my two co-writers and directors and we thought – ‘What would make the best possible Derren Brown show?’ None of us were sure what the UK would make of it, but the resulting show felt so good, and met with such a great response when warming it up in London, that we decided to tour it here too. The reviews have been astonishing, and people who’ve seen all the shows have said they love being surprised by them again, and those who don’t know me so well are getting to see the best material for the first time. It’s a huge, huge joy to perform”. What is happening with the Glasgow shows in June? Neither ARG nor the Theatre say the event is happening ??? Where/when can we get tickets? I’ve just stopped by the Theatre Royal box office and they say that tickets go on sale on the 14th of December. Hope that helps! Any dates for Newcastle upon Tyne, please? Why are the Glasgow tickets not on Sale yet? When will Glasgow dates be available please? Are you coming to any theatres in Bedfordshire? – Grove theatre in Dunstable would be perfect ?? Please please come back to MK, we gave you a lovely welcome in 2016! Yes I’m a vote for the Isle of man too please Derren. Tell me St Albans Arena will be a surprise gig… Gwan! Is the show 1 hour long? My Son took me to see Derren on Saturday 12th May in Cardiff, he was absolutely amazing. Would love to go again but just too far now. Definitely something i would do again though. Australia please!!!!!!!!!!!!!! I have watched all your videos on YouTube and need to see you live. Please!!!!!!!!!! Will you be coming back to Llandudno next year with show ? Will you be coming back to Llandudno with new show ? You are welcome in America, Darren!! Derren, please, please, please come to Melbourne, Australia! There are so many people here who love what you do and want to see you do it live. Exeter or anywhere closer than Cardiff would be sppreciated! Come to Winnipeg, Manitoba, Canada! PLEASE COME TO DENVER COLORADO!!!!!!! ?? BLESSINGS, LAURA. HI, will you have plans to attend the USA, Western are of the states, I have a daughter that could use faith healing. Hi Derren, I just watched your show Miracles on Netflix and loved it so much. I searched your videos in YouTube straight after that. I would really love to watch your live show and wonder when are you coming to Australia. Please kindly advise. Love, Lenny Halfacre. Will be in London September 19-21 2018 any shows available, I will definitely come to see you!! Is Derren performing July 18? My family and I will be in London on that date and we’re hoping that by some miracle we could catch a show. The four of us formed a circle, casted away all negativity, and tapped into the universe’s boundless energy and the universe compelled us to fly from Phoenix,Arizona to London on the 18th of July to see Derren. Now we just need to know which venue to buy tickets, or perhaps the universe meant for us to have a private meeting. Far be it from me to question the mysteries of our energy fields. Please let me know where to show up on the 18th. Are you coming back to Sydney Australia anytime soon!? Come to Montreal, Canada Please!! Derren please come to Australia soon..
Amazing show yet again. My utter gajf is convinced there’s stooges within the audience, but I don’t think this at all. Could sit through this time and time again. Well done, can’t wait for the next one. Just missed this tour! So gutted? When is the next one please ? Could I be notified by email please? We need a North American tour! Not just the USA but Canada too please.